Old map by FILLOEUL -Carte Generale de L’Egypte. 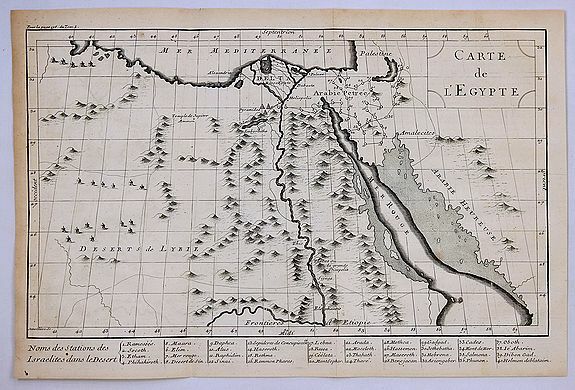 Title: Carte Generale de L’Egypte. Size: 9.8 x 15.4 inches. Condition: In fine condition with usual age toning. A striking map of Egypt. It is from METHODE POUR ETUDIER L’HISTOIRE by L’Abbe Lenglet du Fresnoy, published in Paris in 1729. The map is quite rare and is not now, nor in the past been on the Internet. It was engraved by Jenvilliers and /or Fillouil who were known to work for Nolin in the early 18th century. The map features a key at the bottom with forty Egyptian cities and important places.